On August 24th, 2017, CISDI Group gave a reception to the new staff of 2017. At the reception, Mr Xiao Xuewen, chairman of the Board, secretary of the Party committee of CISDI Group sent cordial messages to the new staff, and encouraged them to bravely take up the mission of the times and actively grow up with the company. 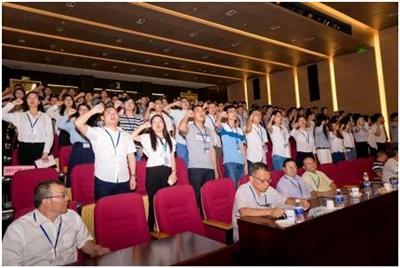 While all the new staff were sworn in, Guo Ran made a speech on behalf of the new staff, pledging that they would be against arrogance and rashness, valiant to assume responsibilities, self-disciplined, firm and indomitable, diligent in thinking, open and innovative, and strive to become the mainstays of CISDI Group for reform and transformation.